Victoria is our veteran mare who has now earned her retirement from breeding and promotion to babysitter. 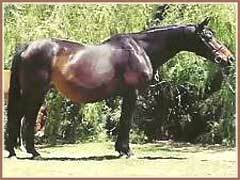 "Vicky" came to us in 1998 with her weanling filly, VICTREE by KASPAREIT. She has since favored us with two full siblings: the excellent colt, VALOR, in 2000 and a gorgeous filly, VIXXEN, in 2002.